With Rupes you get what you pay for with the Big Foot Polisher Bag. Reinforced seams are found at every corner while the shoulder strap is attached with metal – not plastic – anchors. 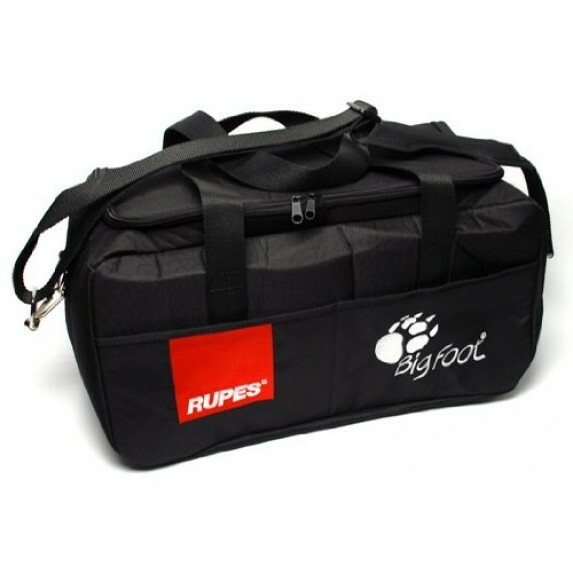 The Rupes Big Foot Polisher bag proudly displays both the Rupes and the Big Foot logo in classy embroidery. The inside of the Rupes Big Foot Polisher Bag has eight pockets for your polishes and compounds; four pockets for 8 oz. bottles and four pockets for 16 oz. bottles. The inside of the bag also features dedicated pockets for holding pads and other accessories. What’s more, a floor-mounted strap holds your polisher in place during travel. You’ve got one of the best car polishers money can buy – it’s only right that you tote it around in the best detailing bag available! 4. What’s more, a floor-mounted strap holds your polisher in place during travel.